Oriental scholar of the sixteenth and seventeenth centuries; born in Aleppo; a contemporary of Joseph Caro, whose Talmudical lectures at Safed he attended. He so-journed for some time in Syria, and toward the beginning of the seventeenth century went to Venice, where he published two works: "Magen Abraham" (1603), which treats of the mystical interpretation of various commandments and ceremonies, and "Neḳuddot ha-Kesef," a commentary on Canticles, published in 1619 by Moses Laniado, who prefaces the work with a note in which he says that Abraham ben Isaac was the author also of unpublished commentaries on the Pentateuch, the Five Scrolls, the Hafṭarot, Psalms, Proverbs, Job, and Daniel. Abraham left several responsa, which are extant in the Royal Library at Vienna and which have been copied and published with explanatory notes by M. Friedländer (Vienna, 1860). Rabbi at Aleppo in the second half of the sixteenth century; contemporary of Moses Alshech and Ḥayyim Vital. He devoted his activity to the Midrashic literature and on that account was surnamed "ha-Darshan." Samuel was the author of the following Midrashic commentaries: "Keli Paz" (Venice, 1557), on Isaiah, excerpts from which were inserted in the "Bibliotheca Rabbinica" (ed. Amsterdam, 1724-27); "Keli Ḥemdah" (Venice, 1594-95; Prague, 1609), on the Pentateuch; and "Keli Yaḳar" (Venice, 1603), on the Earlier Prophets. 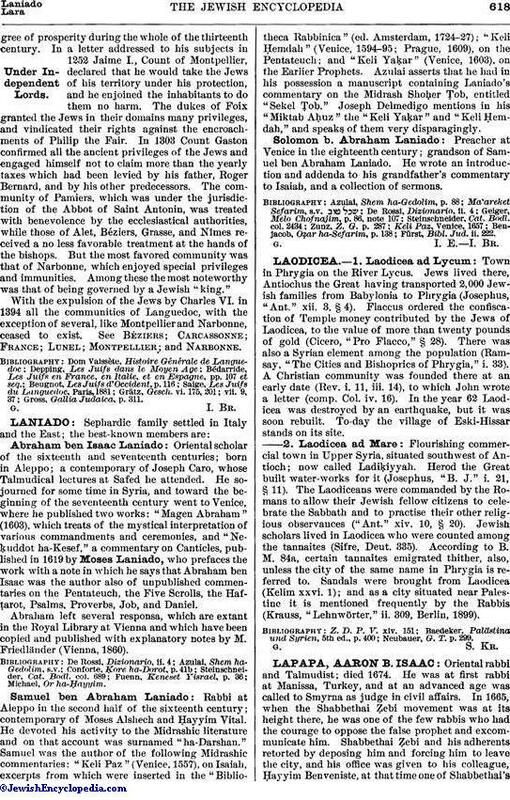 Azulai asserts that he had in his possession a manuscript containing Laniado's commentary on the Midrash Shoḥer Ṭob, entitled "Sekel Ṭob." Joseph Delmedigo mentions in his "Miktab Aḥuz" the "Keli Yaḳar" and "Keli Ḥemdah," and speaks of them very disparagingly. Preacher at Venice in the eighteenth century; grandson of Samuel ben Abraham Laniado. He wrote an introduction and addenda to his grandfather's commentary to Isaiah, and a collection of sermons. Fürst, Bibl. Jud. ii. 222. G. I. E. I. Br.